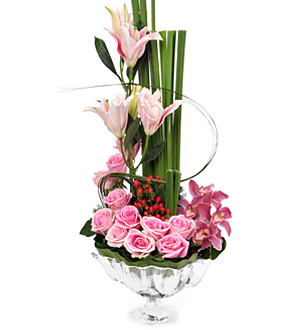 A spectacular mix of imported flowers in a contemporary Levine designer Compote Glass. Cymbidiums, Roses, Stargazers and Bear Grasses. Compote Glass measures 31cm (D) X 29cm (H). Flowers in Glasses and Vase is an ideal gift for Birthday, Anniversary, Housewarming, to Congratulate, Festive Giving or simply to say 'Thank You', 'I'm Sorry', 'Well Done' or "Be Happy".